I’ve always wanted to write an ASCII Art program, if only for the fun of it. This post takes you through the different steps you need to write your own, or you can pull apart my source code. Full code listings are provided. I’ve tried to make this project as extensible as possible, so creating your own custom ASCII brush should be trivial. This provides the basics of an ASCII Art program, but there are few things we need to fix up before this will work correctly. Firstly, this uses a one-character to one-pixel relationship which causes the ASCII images to be huge in comparison to the original JPEG. Secondly, a pixel is always square whereas a character usually occupies a rectangular space. This causes our image to be stretched vertically. 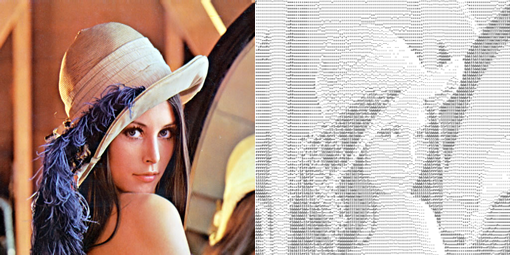 Both of these problems can be solved by resizing the image prior to processing. I usually reduce the width and height to 25% and scale the height down futher to 63% to correct the skew. The exact figures to use will depend on the font and size you choose. I'm using Lucinda Console at 8pt.